Scott Brown, PhD is a Research Associate Professor in the Department of Public Health Sciences at the University of Miami Miller School of Medicine, with a secondary appointment in the University of Miami School of Architecture.He has an interest in the impacts of neighborhood built (physical) and social environments on residents’ health and well-being across the lifespan. He is Project Director of the UM Built Environment, Behavior and Health Research Group, and for 15 years, has led cross-sectoral, cross-disciplinary federally-funded research studies (NIH, HUD, CDC) to understand those built (physical) environmental policies and strategies that promote health for the most vulnerable residents (i.e., elders; the poor), particularly those at risk for physical inactivity, social isolation, and behavioral health problems. He is Co-Leader of one of 11 inaugural teams selected by the American Institute of Architects (AIA) Design+Health Research Consortium, and is PI on a Robert Wood Johnson Foundation grant examining health impacts of greening (tree-planting) initiatives in low-income Miami neighborhoods. As Principal Investigator on a US HUD grant, he published the first study to link block-level greenness (vegetative presence) to lower risk of chronic conditions (e.g., diabetes; hypertension), using data on ~250,000 Medicare beneficiaries. He participated in 3 NIH grants (as Co-PI, Project Director, or Investigator) on built environment (e.g., land-use mix such as stores near homes; “eyes on the street” features such as porches) and Hispanics’ health. His research findings are described in the US EPA’s Guide to Smart Growth and Active Aging; and the Active Design Miami guidelines. The overarching goal of Brown’s research is to inform policies pertaining to the built environment to enhance health in the most underserved populations and communities. 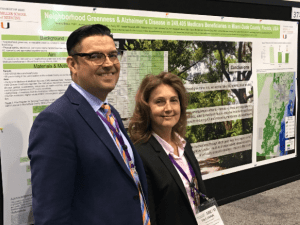 Most recently, he presented his research findings (see below) linking higher levels of neighborhood greenness (e.g., tree canopy; parks) to lower risk for Alzheimer’s disease at the ‘Developing Topics” session of the Alzheimer’s Association International Conference (AAIC) in Chicago, in July 2018. This research examined data from 249,405 U.S. Medicare beneficiaries. Participants were individuals 65 years and older living in the same location in Miami-Dade County across two calendar years (from 2010-2011). Multilevel analyses assessed the relationship between neighborhood greenness, assessed by mean block-level Normalized Difference Vegetative Difference via satellite imagery, and Alzheimer’s disease diagnosis using Medicare claims data. Covariates were individual age, gender, race/ethnicity, and neighborhood median household income. 5.49% (n=13,685) of beneficiaries had a diagnosis of Alzheimer’s disease. Higher levels of neighborhood greenness (NDVI) were associated with lower odds of Alzheimer’s disease, even after adjusting for individual age, gender, race/ethnicity, and neighborhood income. When compared to individuals residing in the lowest tertile of greenness (NDVI), those individuals residing in medium-greenness neighborhoods (middle tertile) had a 16% lower odds of Alzheimer’s disease, and those residing in high-greenness neighborhoods (highest tertile) had a 20% lower odds of Alzheimer’s disease. These relationships remained statistically significant even after adjusting for number of comorbidities. Neighborhood greenness may reduce risk of Alzheimer’s disease among older adults. Environmental improvements, such as increasing trees and vegetation in neighborhoods – even to moderate levels — may be important modifiable factors for reducing Alzheimer’s disease and improving mental and general health in older populations.